1) During cataract surgery, you break the posterior capsule and decide to switch from placing a one-piece acrylic to a 3-piece IOL. Name one thing that you need to do differently when preparing to use a 3-piece IOL (instead of single piece acrylic IOL). 2) What is “optic capture”? 3) In what location (in the eye) should you NEVER place a single piece acrylic IOL? 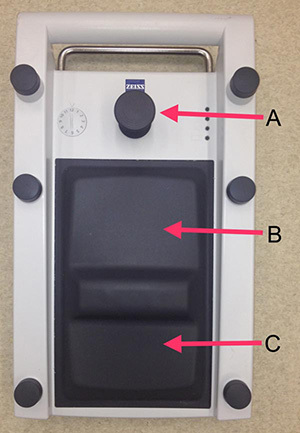 5) Describe what each of the 3 positions on the phaco pedal do. 6) Describe the time out procedure during cataract surgery. 7) Why is the Kuglen called “diablo’s hook”? 1) Describe the differences between: (i) Divide and conquer (ii) Stop and Chop (iii) Quick chop. 1) At the end of an uneventful cataract surgery case, you notice that the temporal wound does not seal well. You decide to place a suture. What suture do you ask for? 2) Name 3 differences between cohesive viscoelastics and dispersive viscoelastics. 3) During the start of cataract surgery, you inadvertently make your temporal wound very long. What problems will this cause and what can you do about it? 4) During cataract surgery, you know that the conjunctiva is ballooning up around you. What is the cause of this and what can you do about it? 1) What is the Little Technique and describe the steps of the Little Technique? 1) What is IFIS?—What causes IFIS?—What can you do if your patient has IFIS? 2) Describe a situation in which iris hooks would be a better choice than a Malyugin ring. 3) You are going to do surgery on a patient with a white cataract. What can you do to help visualize the anterior capsule? 1) During quadrant removal, you notice a hole in the posterior capsule. What is the most important next step? 2) After identifying a hole in the posterior capsule and filling the eye with Viscoat, you decide to pause for a moment to breath. While you collect your wits, you decide to ask the nursing staff for some supplies that you might need given the hole in the posterior capsule. Name 3 items that you will need.